Welcome to the GrizzlyStik success pages. Take your time and enjoy browsing these photographs of bowhunters who know the satisfaction of hunting hard with GrizzlyStik arrows and broadheads. If you have your own success photos you'd like to share with us email them to: Success@Grizzystik.com. Please include the following information: Your name, the kind of 'critter' taken, the state or province taken in and your equipment list. We'd also like a few words describing your hunt if you'd care to add that. Note: By submitting images and descriptions to GrizzlyStik you authorize us to use them online and in print for promotional purposes. We love it when our bowhunting friends share their successes with us and bowhunters around the world enjoy looking though bowhunting success pictures like these. 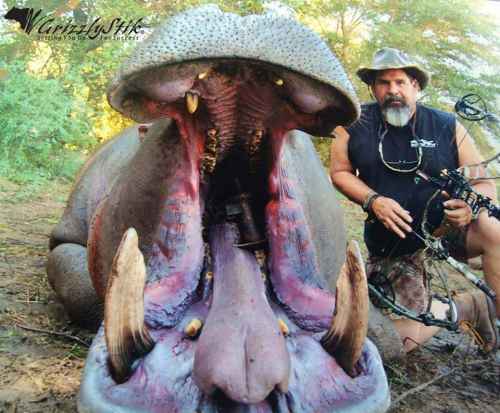 "The .500 Nitro of Bowhunting" - With over 90 confirmed jumbo's taken with the GrizzlyStik system, who's to argue? For this safari, we matched our 1250 grain (TAW) GrizzlyStik Momentum TDT arrows tipped with our 315 grain forged Ashby broadhead. The arrows had a 31% FOC and were powered from a 85# bow. 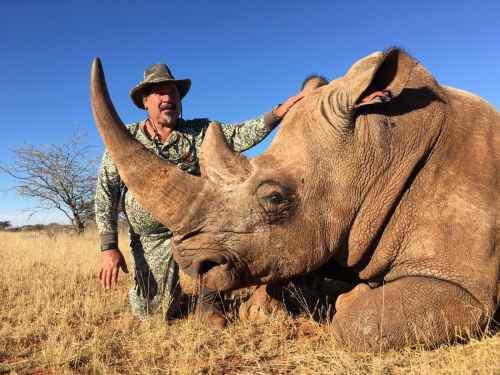 “Green Hunt Rhino” - Safari Club International recognizes green hunts (darting/measuring/releasing) rhino to count towards your Big 5. 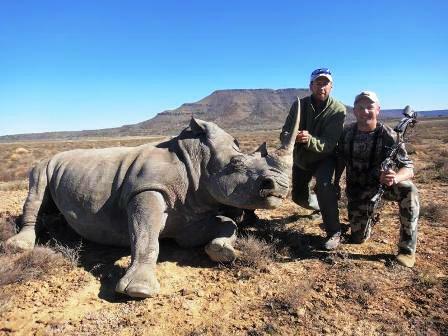 This black rhino was darted with a modified GrizzlyStik Momentum arrow and released while hunting with Tam Safaris. 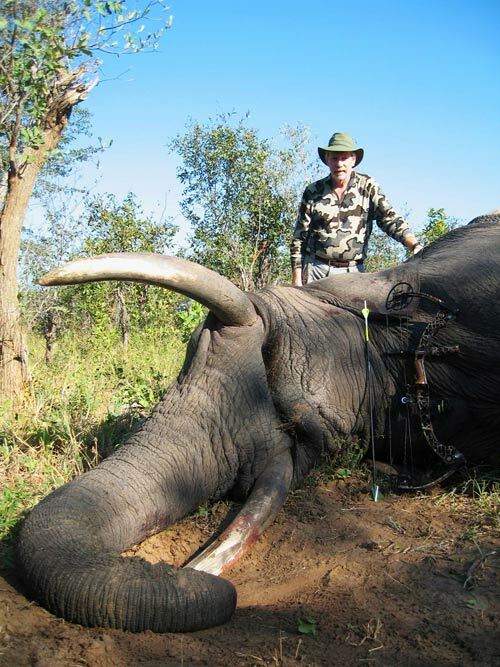 One Arrow Jumbo - "What an amazing safari, I got to live my childhood dream. After a week of tracking and several blown attempts I finally got the shot opportunity we were looking for. We got to within 35 yards of this bull and he presented an almost perfect broadside shot. 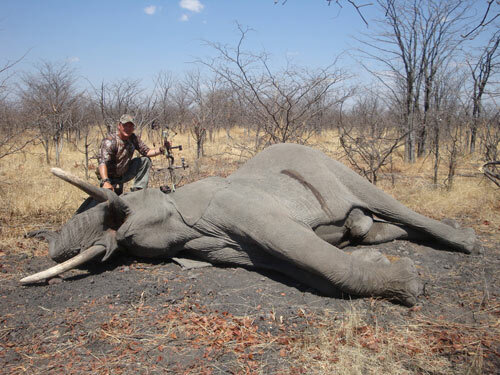 For this Jumbo safari, Jim was shooting a 950 grain arrow tipped with an Ashby broadhead and powered from a 73# bow. 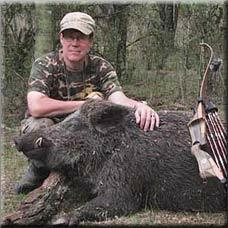 Bowhunting book author and past SCI President Gary Boogner with Hippo success shooting a 950 grain GrizzlyStik Momentum arrow tipped with a 315 grain forged Ashby broadhead. 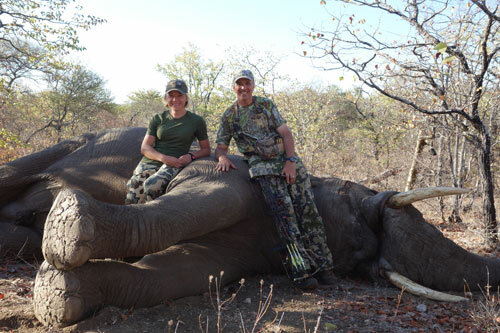 Pedro Cavadas and PH Ben Rautenbach of Zambeze Delta Safaris with a Mozambique Jumbo taken shooting Ashby Broadheads. 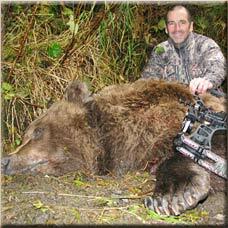 When it comes to the big stuff, the GrizzlyStik record of lethal arrow & broadhead performance is simply umatched. 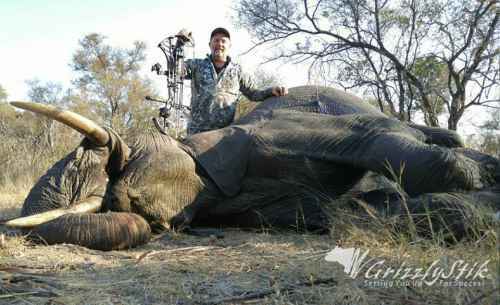 Our systems have earned the gold standard - not only from bowhunters but from many of Africa's top dangerous game PH's. 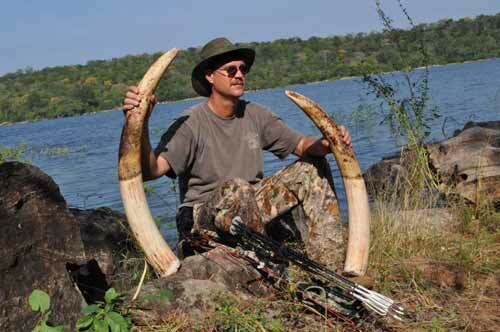 SCI booth regular, Steve Konieczny resently rounded out his Dangerous 7 while hunting with Watts Trophy Hunting Safaris in Zim. For his elephant, hippo and croc we built Steve a quiver full of 1250 grain (all in) GrizzlyStik Momentum arrows tipped with our 315 grain forged Ashby broadheads. The arrows had a bone crushing 28% FOC and were powered from a 82# bow for this one shot archery kill. 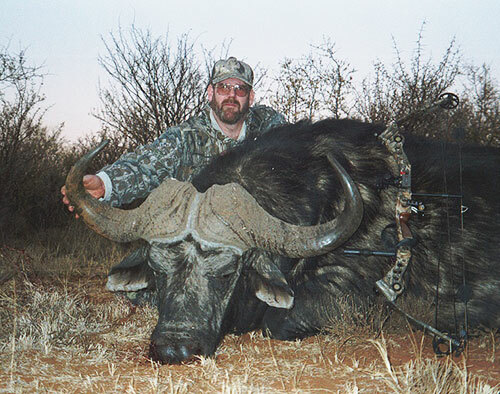 Jeff Campagna and his wife Dasha had a fantastic safari with each taking multiple animals. 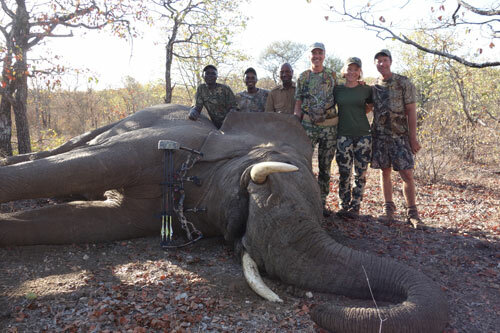 Here are a couple pictures they sent os of the elephant Jeff took with the forged 315 grain GrizzlyStik Ashby broadhead and GrizzlyStik Momentum 175 arrows. 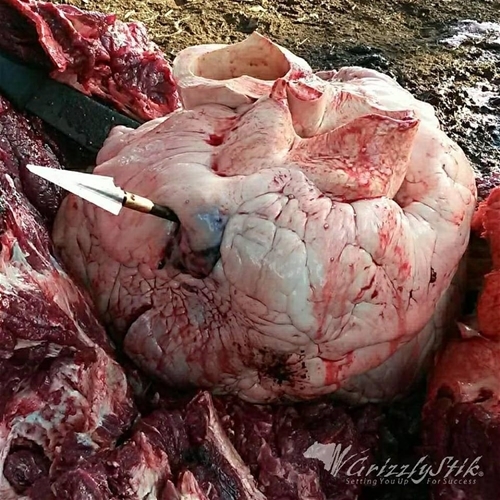 According to Jeff the arrow clipped a rib on the near side, went all the way through both lungs, clipped a rib on the far side and the blade stopped just shy of poking out the skin on the far side. 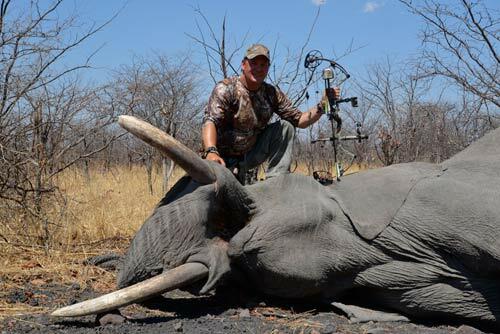 One arrow elephant kill - it can be done when you set yourself up for success with 1250 grains of the GrizzlyStik arrow and broadhead system. See their other animals - including a giraffe here. 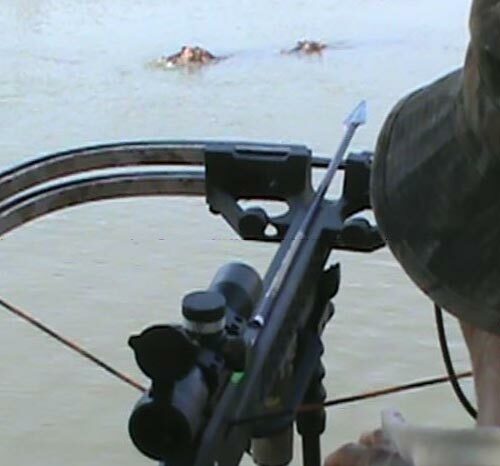 8000# Hippo Pass Through - Ask yourself, could my arrow and broadhead system show me that? 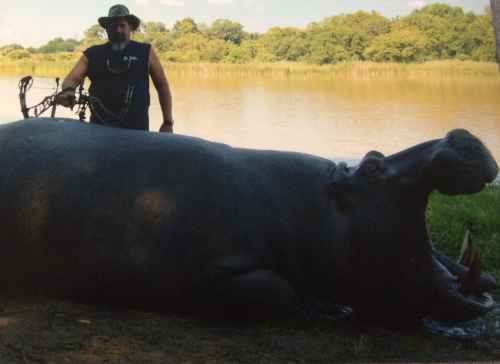 For this hippo safari, we built our customer a 950 grain system with GrizzlyStik Momentum TDT arrow tipped with our 315 grain Nanook broadheads. The arrow had a 29% FOC and split ribs on both sides before poking out the offside. 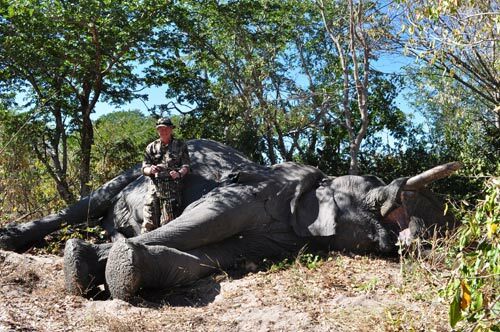 This Zimbabwe Jumbo is the sixth African elephant shot by Dr. Jan Seski. For this hunt Jan used our custom-built GrizzlyStik Momentum 175 arrows cut to 29 inches and fletched with 4-inch DuraVanes to accommodate his finger-shooting style. 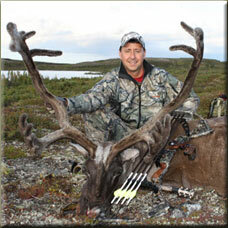 The arrows weighed 1275 grains when topped with a 315 grain Ashby Broadhead with a FOC of 29%. 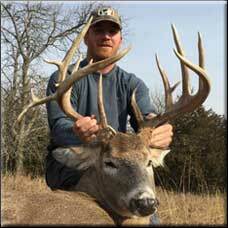 Shot from an 85# Matthews Monster bow, this set-up generated 106 ft. lbs. kinetic energy. 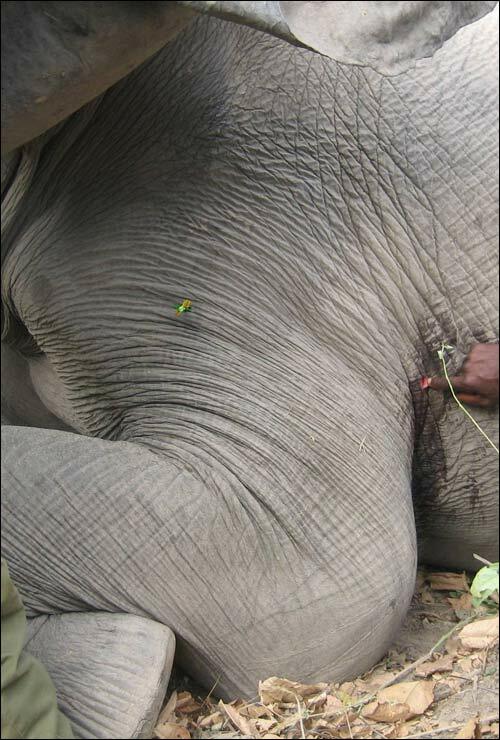 The arrow was shot quartering into the elephant, penetrated a rib and one lung, lacerated the heart and liver, and was recovered in the gut. 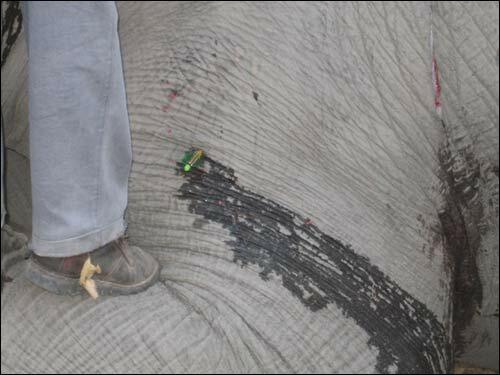 The elephant went a short distance and died. 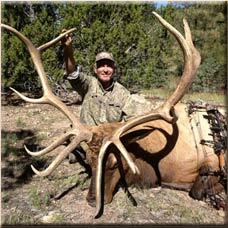 With results like this, no wonder Jan is a firm supporter of our Ultra-Magnum Arrow System. 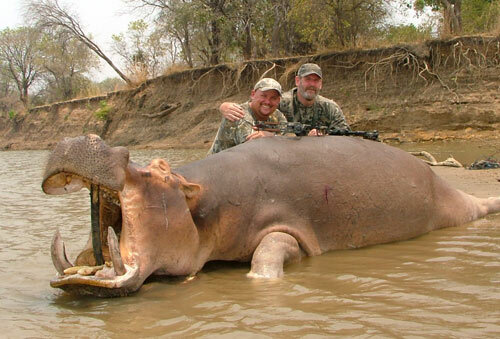 In 2010 I hunted hippo with Strang Middleton in Zambia. I used the heaviest Full Metal Jacket arrow without going to the dangerous game ones and I used a Silver Flame broadhead. I used an insert to get my arrow weight up to 1,000 grains. Used a Mathews Monster Bow set at 80 lbs. I’ve attached a picture, I got full penetration (you’re looking at the exit wound). I can’t recall if I hit the ribs or missed ‘em. However, the arrow passed completely through except for the fletches which allowed me to recover the arrow and broadhead. 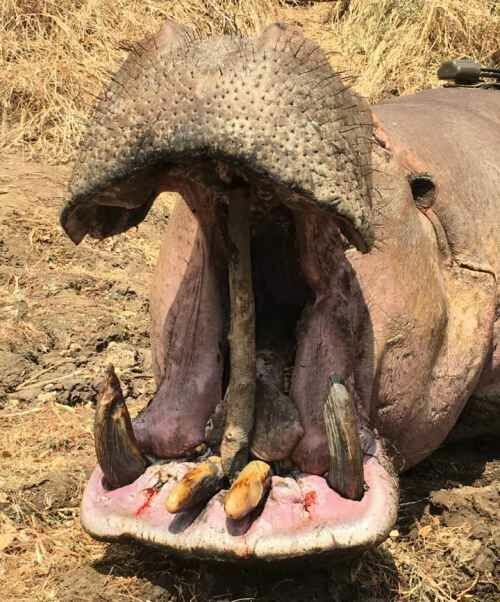 The hippo never knew what happened and died in under 1 minute. 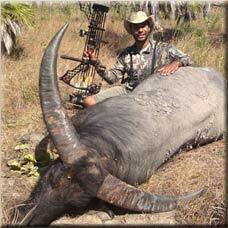 I used a Silver Flame broadhead on the attached buffalo picture. I used Easton aluminum arrows 2419 and a Mathews Safari bow at 90 lbs. On this one, I went through the thickest part of each rib-clear through the near rib and about 1/4 of an inch of the broadhead poking through the outside rib on the far side. The buffalo went about 60 yards measured from the shot to where he died - and he died in about 2 minutes (which made for some happy trackers). The PH made a wall display for me with the ribs, my arrow and the broadhead. I missed your seminar at the SCI show but I’m a firm believer in heavy arrows and stout 2 blade broadheads. 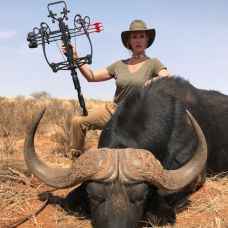 We hunted Mozambique one year and I wanted to be able to shoot flatter at distances so I went with light arrows and 100 grain broadheads (2 bladed). 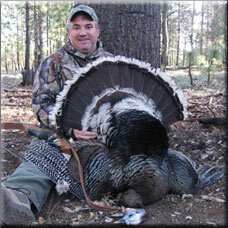 It was a disaster – I got no penetration and the broadheads were often broken or bent when I recovered them. I just remember it taking 2-3 arrows per animal that trip. 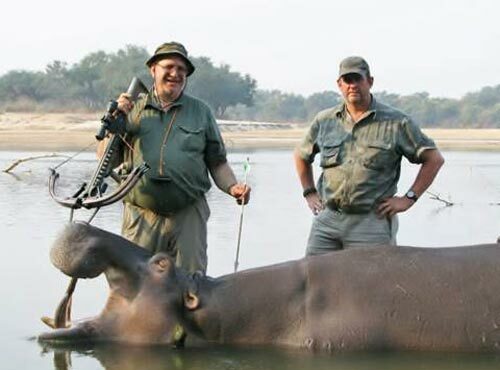 The hippo and buffalo both died with a single arrow. I’ll admit when I make a poor shot and it requires a follow-up; but with the light arrows/broadheads it didn’t matter where I hit the animal, it always required a long track to recover and multiple arrows. I’m lucky as I have a long draw length and shot a long arrow at high poundage (not as high as it used to be though), my wife has a heck of a time with arrows/broadhead combinations. 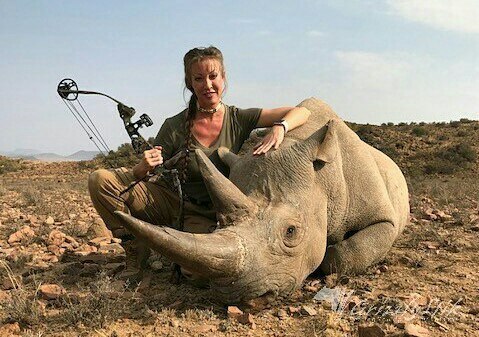 It can just be frustrating to experiment with various arrows and arrow weights to try to find the optimum hunting arrow/broadhead combination for her. Thanks for making such a great product-hard to find heavy broadheads anywhere as it seems most folks are still into the light weight arrows and 100 grain broadheads. 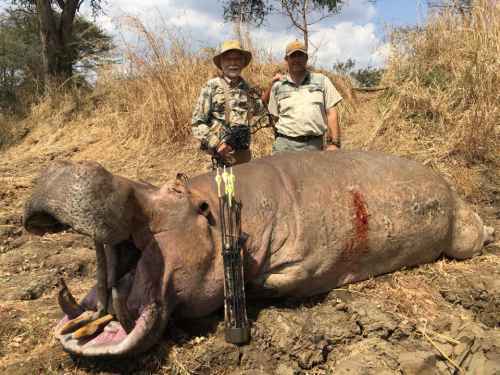 Congratulations to Dr. C on this pending #1 SCI hippo taken with an 82# bow, GrizzlyStik Momentum 175 arrows and GrizzlyStik 200 grain single bevel Maasai broadheads. 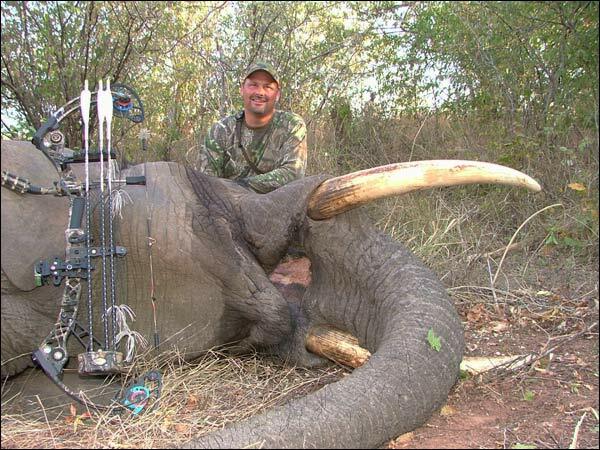 Really nice bull elephant taken by Dr. Jan Seski with one Ashby tipped arrow. 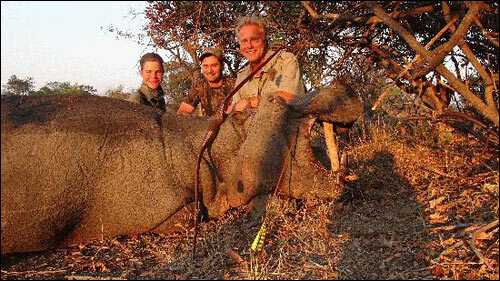 The bull was quarteing away at 20-yards. The arrow struck high in the crease, traveled between ribs on the near side, cut completely through the top of the heart, then kept going out the other side, once again, between ribs. 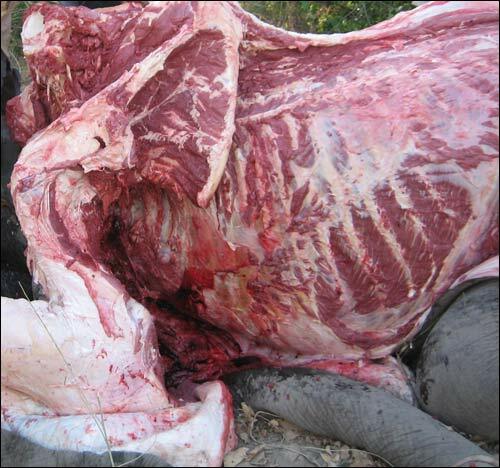 The ivroy was 50+# per tusk. 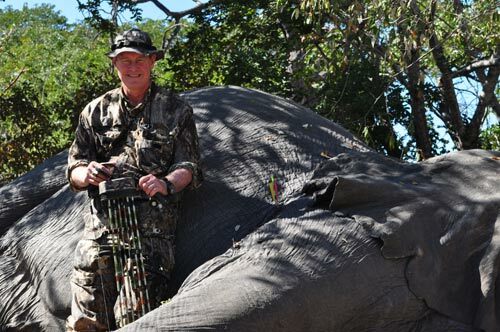 Congratulations to Dr. Jan Seski on another fine elephant with the bow and arrow. 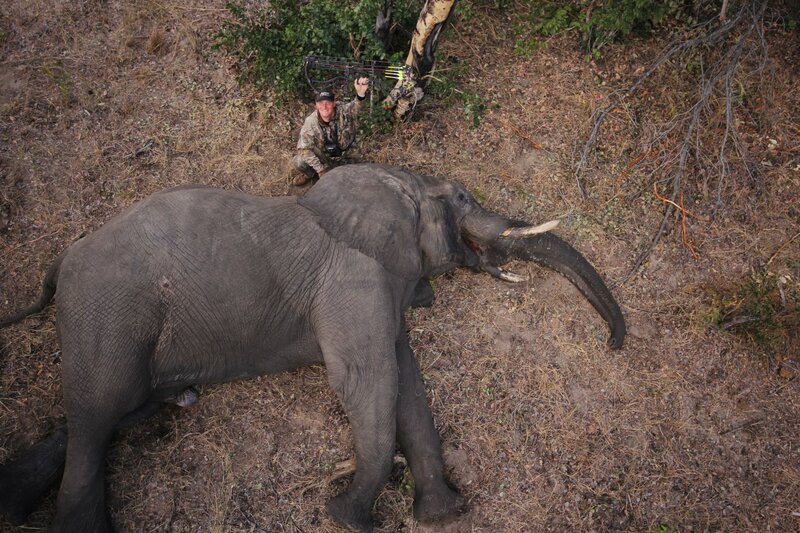 Note: Dr. Jeski used our forged, one piece, single bevel 315 grain Ashby broadheads to take this elephant. 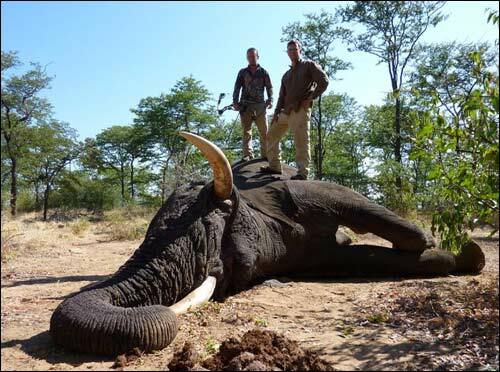 This hunt was booked with Neil Summers of Bowhunting Safari Consultants. 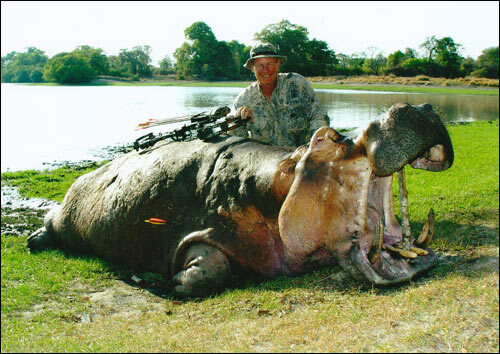 Congratulations to Jim Aken for taking the first Hippo that will be entered in the SCI record books - taken with a crossbow and an Ashby 315 forged single bevel broadhead. "Thank you for the research and the Ashby articles on your website. 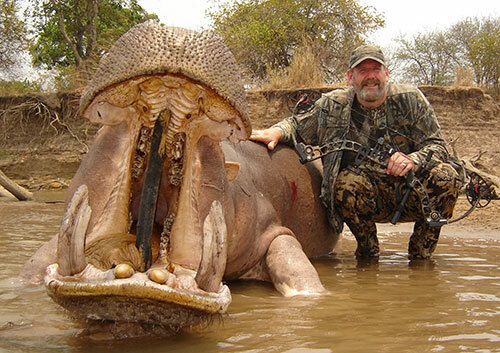 I read everything on your website including the articles by Dr. Ed Ashby while preparing for this Hippo hunt. Then I built my arrows according to that advice. 1251 grains, total weight, 34.9% FOC, 315 grain Ashby broadhead from GrizzlyStik.com. For some reason, I thought the hide of a hippo would be soft, I guess that was because they spend nearly all their time in the water. However, nothing could be farther from the truth, the hide of a hippo feels like a truck tire, it is extremely tough and thick. My first arrow went through a rib on the near side and buried into a rib on the far side, piercing both of the lungs. 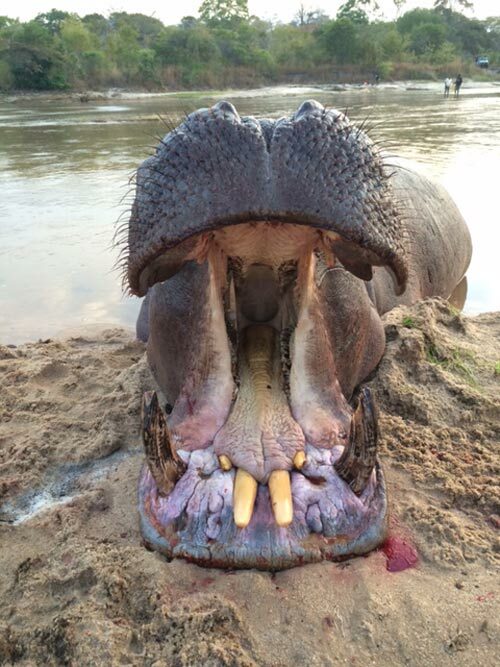 A hippo rib is approximately 3/4 to 1 inch thick. My second shot was a quartering-away shot. It entered behind the ribs on the near side and exited the far side from the shoulder area. 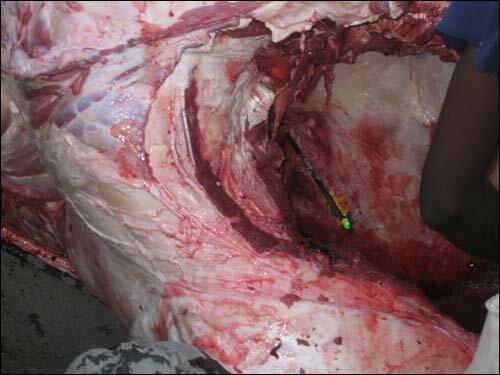 In the lower picture, the arrow entered where I am standing and you can see the exit wound just at the water level at the point of the shoulder, for a total travel through the animal of about 5 to 6 feet, penetrating both lungs and taking a major artery off of the top of the heart. 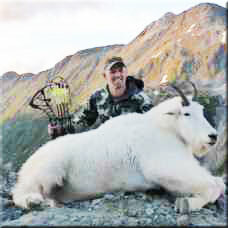 Success on this hunt was due to the arrows built in accordance with the research information from GrizzlyStik.com ,the extremely powerful and rugged Kodabow "Dangerous Game" crossbow and the Ashby broadheads from GrizzlyStik.com. The 1251 grain arrows with the Ashby broadhead were absolutely phenomenal! 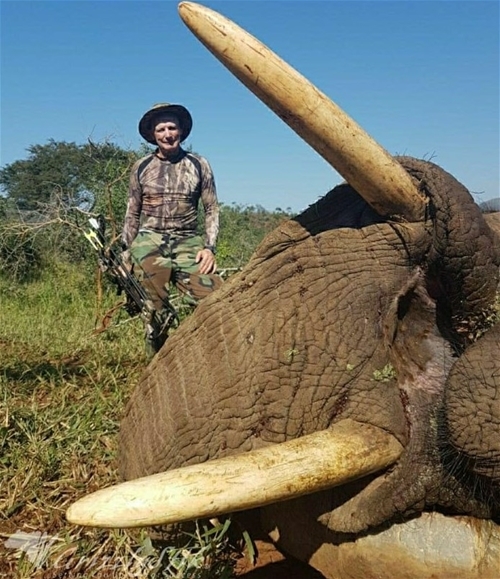 Congratulations to Jon Soderholm on this elephant taken with 1250 grain Momentum 175's and Ashby 315 grain forged single bevel broadheads. 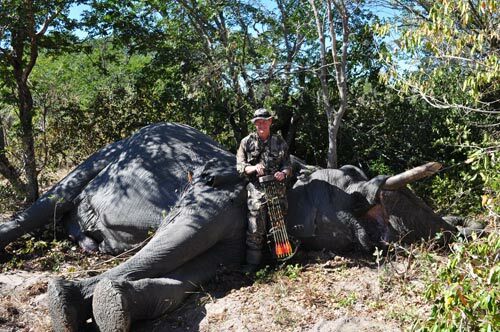 This hunt was booked with Chattaronga Bowhunting Safaris through Neil Summers of Bowhunting Safari Consultants. 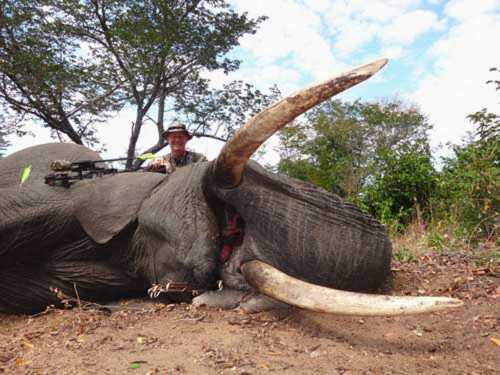 Dr. Jan Seski took this elephant bull with 45 pound ivory with one Ashby tipped arrow. 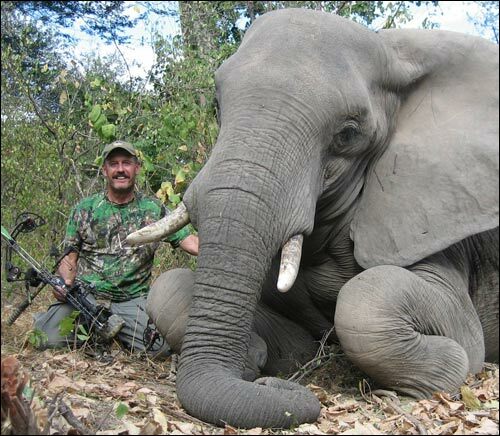 He booked his hunt through Neil Summers of Bowhunting Safari Consultants. 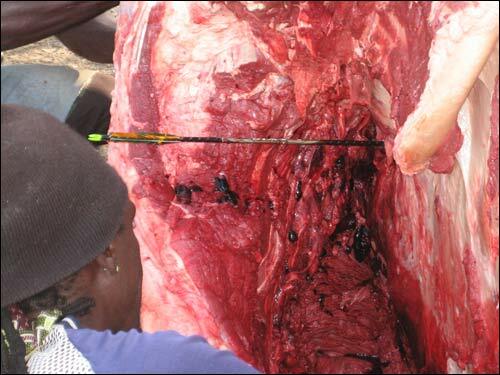 Look at the penetration Dr. Seski got with the Ashby broadhead even after going through the elephant's rib! Congratulations Dr. Seski!! 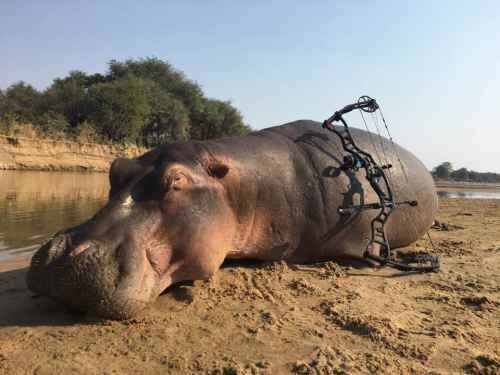 Take a look at the penetration Jan Seski got on this hippo with a GrizzlyStik Ashby broadhead.Jan used an 85# Mathews Monster with a heavy arrow that drove the Ashby broadhead into the far rib. 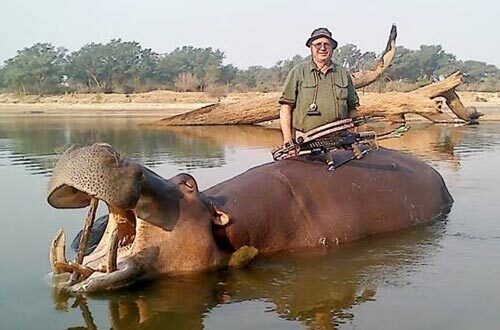 Congratulations to Jan on a fine hippo taken with one shot. 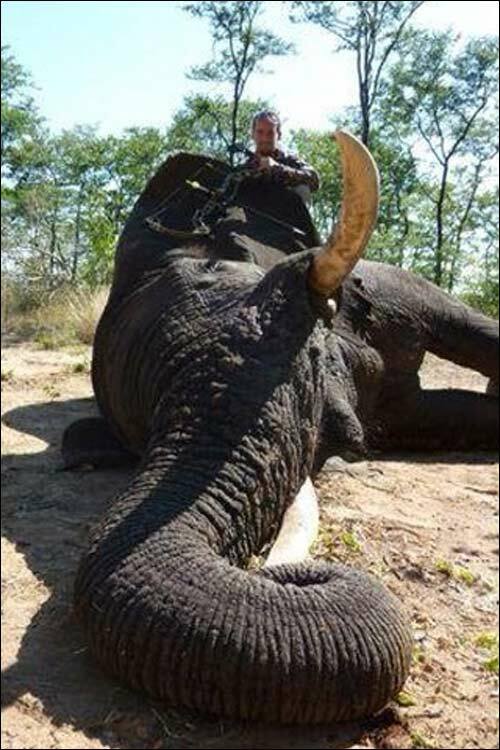 Congratulations to Luis Villalba who took this elephant with our forged single bevel GrizzlyStik Monarch 200 broadhead. 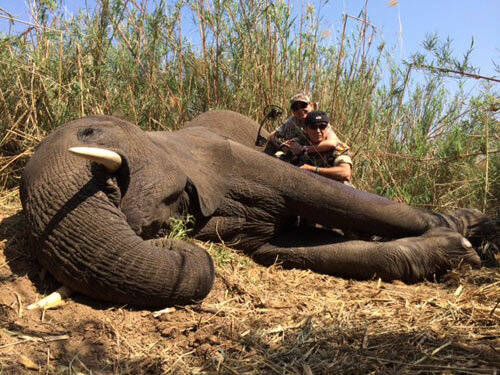 This jumbo fell to one of your GrizzlyStik Momentum 175 arrows with the GrizzlyStik 210gr Silver Flame. Total arrow weight was 1250 grains with a 30% FOC. The bow was a Bowtech Insanity set on 80#. 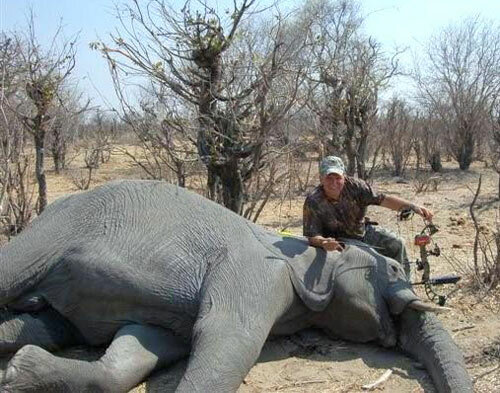 The arrow penetrated to the fetching on the shoulder and the jumbo made it 300m before going down. 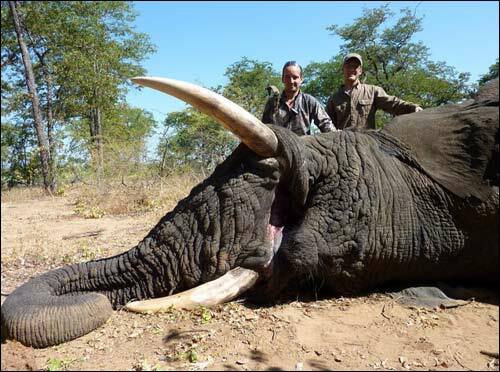 Well, we finally got him.............. a big old bull, past his prime, and losing bulk. They were great hunts and stalks, but good trophies were not to be found for a week. Shot him from 33 yards............ had to wait a LONG time in agony for him to get the right position............had a very narrow shooting lane (nearly 1.5 hours waiting in the HOT Zimbabwe sun, but enjoyed every moment). We got home safely; and even took a helicopter ride over Victoria Falls and Zambezi National Park…………. THAT was fun ! 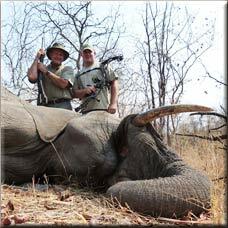 It is now just sinking in about my elephant………… that was the most difficult and challenging hunt…… more mentally than physically. 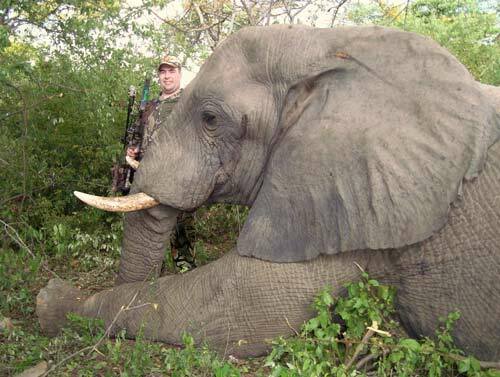 I definitely had the elephant curse, and learned a lot, but so many bow-hunters before me have had the same sort of luck on elephant. I guess that is why it is not done too often. My first shot, was a bit far back, but perfect on height, and double-lunged him. The arrow disappeared in him……………. Whew! He was immediately sick, and the rest is history. 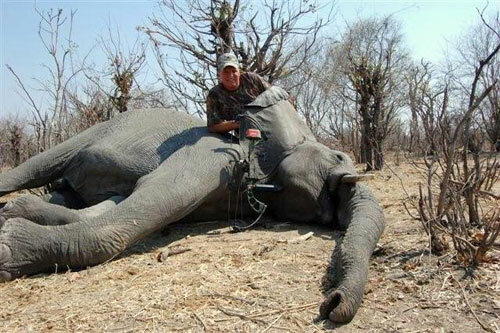 The truth is, we are all still learning about killing elephant with an arrow…………. My shot worked very well. 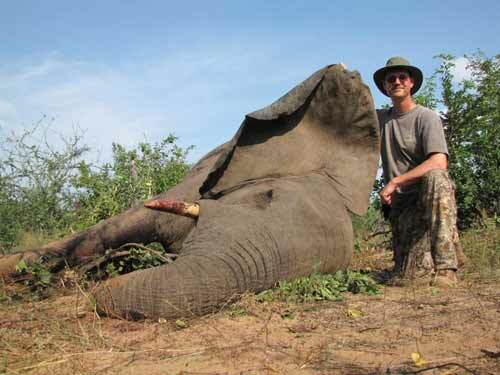 He did not run, did not travel far, and I added a second shot from 45 yards as he walked by in thick Mopane forest. It was the icing on the cake. It was quite a moment to see the giant collapse. 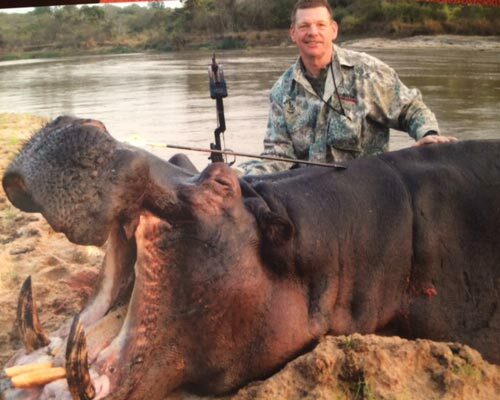 PH Strang Middleton and bowhunter Harry Molligan with a one shot kill on a Hippo with an Ashby Broadhead. 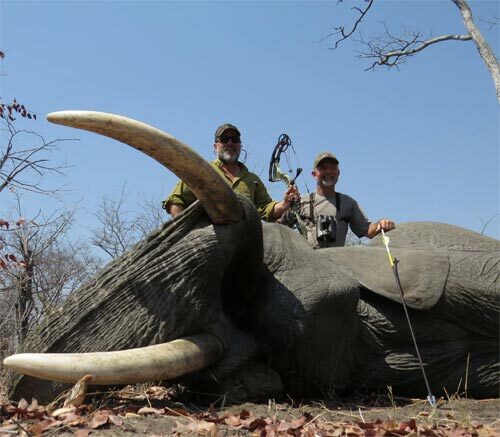 "Note: Robert used our 315 grain Ashby broadheads and GrizzlyStik arrows on this elephant. The situation had unraveled quickly. He was facing us dead-on and wouldn't turn broadside. Now was when I had to truly, truly trust the equipment. I knew the math about the Ashby Broadhead and the 1250-grain GrizzlyStik. I'd read the articles. But math isn't helpful in the Moment of Realization. Would it hold up? Would it even penetrate the hide? I found where I thought the heart ought to be and released. Then I watched, stunned, as an elephant that had been angrily stamping its feet at us suddenly staggered back as though punched, then he turned and ran. 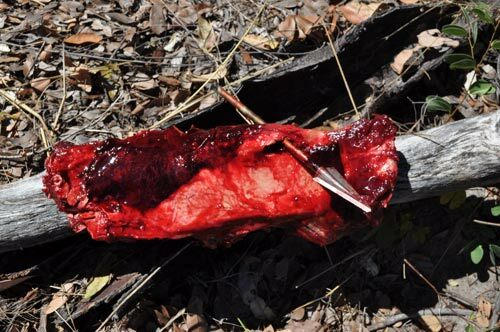 When we finally found him, and after hitting him several more times (because, you know, the adrenaline thing) we discovered that the first arrow had sliced through at least six feet of hide, ribs, lungs, and guts like a mad butcher and was buried behind the stomach. Another arrow had entered one side and snagged against the hide of the other, very nearly a complete pass-through. I believe the math now. 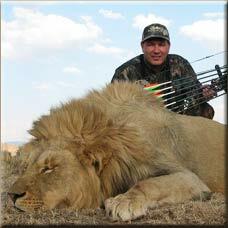 "It took quite a while to get close but I shot him at 40 yards with my bow. We he went down in about 15 minutes. While they were taking blood samples and checking him out I posed for pictures and we took measurements of the horn for a replica. After that they gave him the antidote and told us to get in the truck. 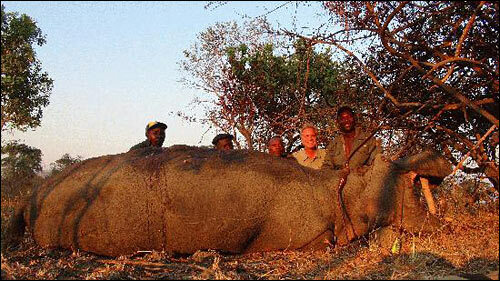 One of the trackers had forgot a rope that was laying next to the rhino. As he went in to get the rope, the rhino stood up and took a few steps. That guy was moving and a grooving getting out of the way and I laughed." 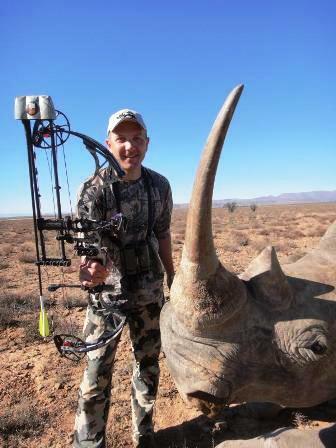 Patrick Hagens - Green hunting Rhino using a GrizzlyStik carbon tapered arrow. 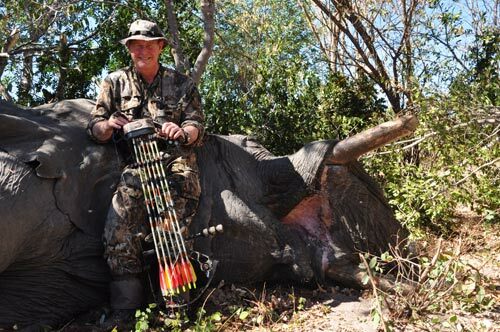 Neil Summers of Bowhunting Safari Consultants took this nice elephant with our Momentum 175 Heavy Game arrows and the single piece forged, single bevel 315 grain Ashby broadheads. The first shot, at 20 yards, penetrated to about half the arrow's length and entered the lungs. 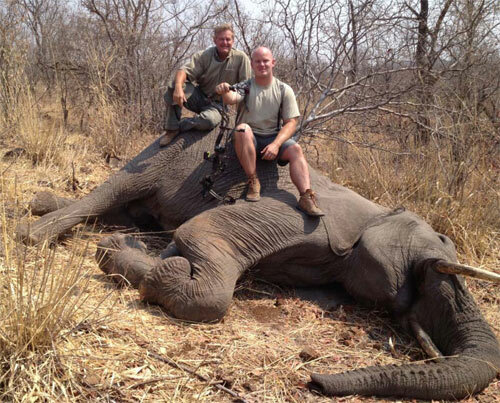 The elephant made it about 150 yards where Neil shot a second time. This arrow disappeared completely going through one lung and the liver. Start to finish the elephant was down in about five minutes. 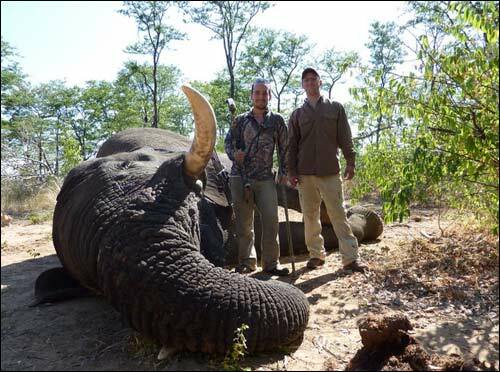 A 1250 grain GrizzlyStik Momentnum 175 and Ashby broadhhead were used to harvest this bull elephant. "Garrett, I finally got my elephant and with an Ashby head. It performed great! I was shooting a 1235 grain arrow and 102 ft- lbs of KE and the arrow totally disappeared in the “crease”. After the shot we backed out and came back 3 hrs later and the bull was dead and hadn’t gone 30 yards. After recovering the broadhead it was in perfect condition and still fairly sharp. One went through 12 inches of shoulder muscle and hit a rib directly but for some reason hit the rib at an angle. It did not breach the rib. However, I got poor arrow flight on the shot. 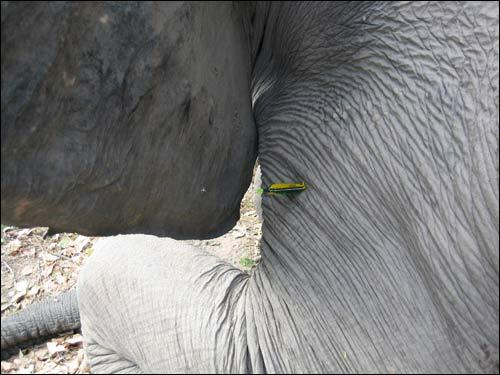 The second arrow went through 13 inches of shoulder muscle and totally disappeared within the elephant. 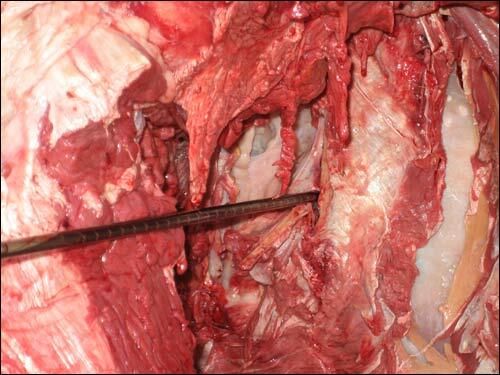 The third arrow went through the forward third of the shoulder and 13 inches of shoulder muscle, broke through a rib, and penetrated almost 15 inches inside the rib. After the shots none of the Ashby heads showed any damage." "Thanks for the fast service regarding my trip to Zambia. 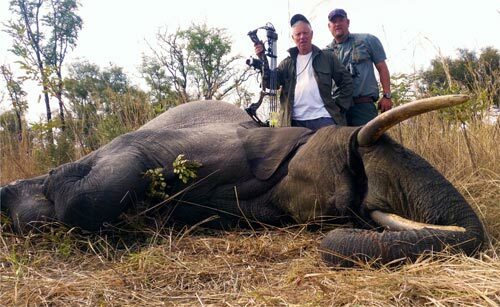 I shot a big male Elephant 5000 kg I used just one arrow - GrizzlyStik Silver Flame 150 grains ran 70 meters and died in 1 minute." Now THAT's an Elephant! 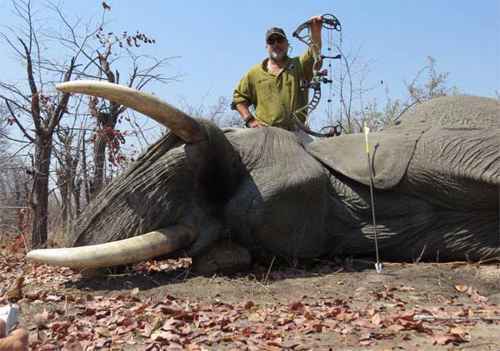 Not only was this elephant big, he was tough AND taken with one arrow, head on. Yes, the shot was a FRONTAL SHOT! 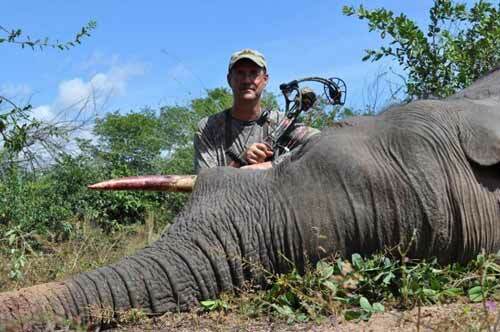 Think about that, have you EVER heard of a bowhunter taking an elephant with a frontal shot? And only one arrow? The hunter used our GrizzlyStik tapered carbon arrow and a GrizzlyStik Ashby single bevel broadheads. If you're going after big and dangerous game, don't take any chances. Use GrizzlyStik tapered carbon arrows and Ashby broadheads - just think of us as the 500 Nitro of bowhunting. 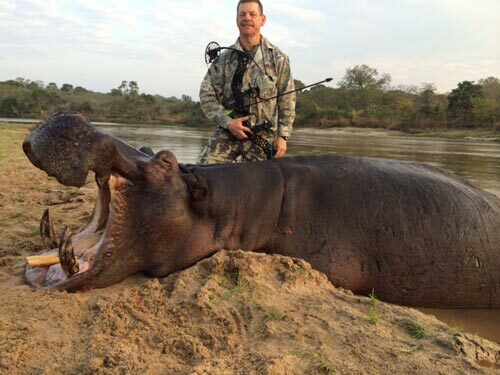 The 950 grain GrizzlyStik arrow & broadhead system made quick work of this hippo. "Hi all, we are back from Zimbabwe, safe and sound. We had a great trip. Killed my elephant on day 5 of the hunt. It was part of a group of 3 that we tracked for over 10 km! 1 arrow at 27 yards, double lung shot, put him down in less than 150y. 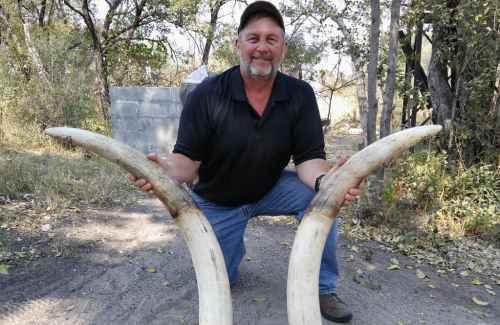 Tim (my PH) estimated that the bull was 20 -25 years old and had 25# ivory. Pretty average for the area. 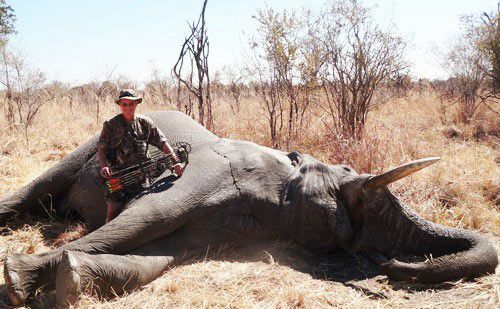 Darrin took this rogue elephant with our 315 grain Ashby broadhead. Congratulations Darrin! Here's a BIG African elephant bull. One shot with our Ashby broadhead. was all it took. 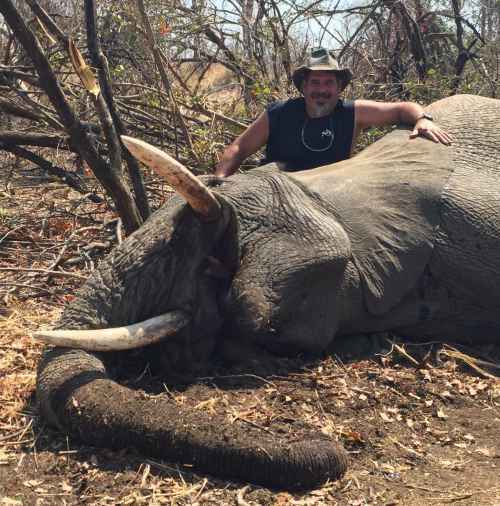 Bill Epeards becomes the first bowhunter to harvest an elephant using both our 315 grain Ashby broadheads and GrizzlyStik arrows. Submit & share your GrizzlyStik success pictures and videos.